I never trust growing tips that are attached on the pot plants and I always been looking for better info on wikipedia for example, but some things cannot be found unless we (I) find a real great botanical (plants) expert. So after years on searching in different country sites for an expert, gladly and finely I found you! 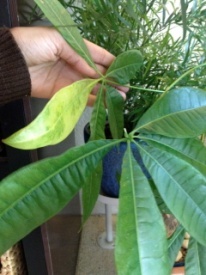 My problem is my beautiful loving Pachira (I love it s much, I have 3 of them) as you can see in photo, the leafs are one by one turning yellow but not before the are somehow white? 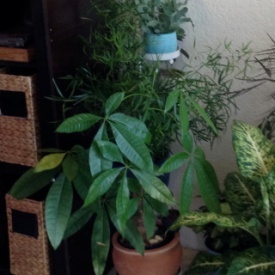 Since this Spring it stays in new mix and never fertilize any of my Pachira nor other of my plants, in the last year. As you can probable see, also my dracaena that stays on top of the plant-stands, is turning yellow-brown and leafs fall down. All my plants have been out on my terrace and a month ago I brought them in. I‘ve them most in very bright artificial light plus I am facing west side. Thank you for your kind words. I hope I can live up to them! I don’t see anything in the photos that suggest a serious problem with your Pachira. However, I cannot clearly see the entire plant, including its pot. It is quite common for Pachiras to lose some lower leaves as they add new ones on top. Keeping the new growth pinched back is one way to reduce the loss of lower leaves and keep the plant from becoming leggy. You mentioned a couple of things that may be causing more leaf loss than usual. It is generally unwise to repot Pachiras and yours may be responding to that because it is easy to over water a recently repotted plant. In addition, moving plants outside where the light is much more intense and then back inside tends to stress plants shortly after each move as they have to adapt to the changed light intensity. If your artificial light is incandescent, then it is of little value to your plants. Fluorescent lights are in a more useful part of the color spectrum for plants. You didn’t say how far from the west window you have your plants, but if they are more than a meter, then that may not be adequate light for them. I cannot see your Dracaena clearly in the photo. I can be of greater assistance if you send me better photos at wcreed@HorticulturalHelp.com.